Machu Picchu deserves it’s own post. 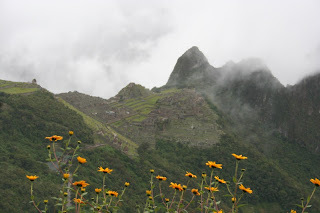 The hundreds of photos I took while in Perú and at Machu Picchu do not portray the beauty that I witnessed with my own eyes. 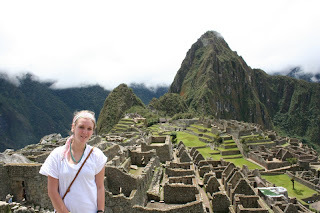 I can’t even find the words to describe how gorgeous and mystifying Macchu Picchu was. The beauty was unbelievable and to comprehend that people, the Incan’s, had created such a place so high in the Andes Mountains was surreal. All I can say is you have to go there! We arrived to the park bright and early to ensure our entrance into the park. Due to my illness the day before and money, we didn’t do the hike up the mountain that everyone talks about. Instead we did hike to the Sun gate first (for those of you who know what I’m talking about). It was really foggy in the morning and one point started raining. However, the clouds would clear for a few seconds and we would quickly try to snap photos of the sights. 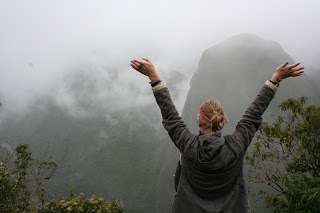 By the time we were done with our hike to the Sun gate, the fog had cleared and we were able to see everything!! The sun came out and it was unbelievable. As I mentioned before, we traveled from Cuzco to Aguas Calientes (town where Machu Picchu is) by train on Monday, March 23. 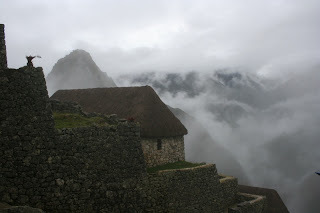 We left early in the morning from Santiago and arrived in Aguas Calientes around noon. It was a 4-hour train ride as the train had to continuously change directions in order to change tracks and gain momentum to climb into the mountains. I really enjoyed the train ride (until I started throwing up) as it was an opportunity to see the true life of Peruvians in the countryside and in the mountains and the poverty that exists within Perú. As a foreigner and tourist, it was hard to see the people and their lives. To think that we were traveling on a train that runs through their neighborhoods everyday, blaring its horn, disturbing their daily activities (going to school or work-must wait till train completely passes through and while they are trying to sleep) and that they have probably never or could ever travel by to see one of the most beautiful places in the world. One of the Seven Wonders of the World. 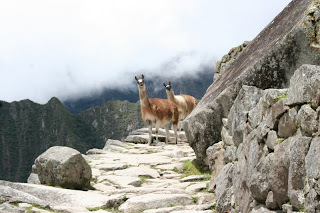 Since I was able to travel as a tourist and had the privilege to see Machu Picchu in all its beauty, the next time I go back to Perú I would like to go with a different motive. I’d like to go back as a volunteer to do social work there.